Fulham eased their relegation worries with a shock victory over runaway Premiership leaders Chelsea. The home side were denied a penalty when Moritz Volz went down under a challenge from John Terry but took the lead through Luis Boa Morte. Collins John then missed a one-on-one for the hosts before Didier Drogba had a goal disallowed for handball. Mark Crossley tipped a Terry header over and Chelsea woes heightened when William Gallas was sent-off. Delighted Fulham fans ran on to the pitch at the final whistle to celebrate a crucial victory. But tempers began to flare when supporters of both clubs began to square up. Certain individuals were involved in several skirmishes before police and stewards restored order. New Scotland Yard said on Sunday evening that one man was arrested on suspicion of affray and taken to a police station where he remained in custody. Fulham quickly imposed themselves on their west London rivals and should have had the chance to take an early lead when midfielder Volz burst into the Chelsea box and was brought down by the sliding Terry. Referee Mike Dean waved away Fulham's appeals for a penalty, but the home side soon made the breakthrough. Paulo Ferreira tried to clear after a Steed Malbranque pass ricocheted off Frank Lampard but only succeeded in kicking the ball straight into Boa Morte's outstretched left foot. Petr Cech had no chance as the ball flashed into the back of the net. 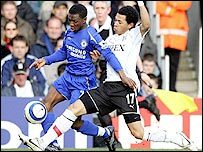 Jose Mourinho's response was to haul off wingers Joe Cole and Shaun Wright-Phillips after 26 minutes, with striker Didier Drogba and winger Damien Duff coming on in a revamped 4-4-2 formation. Duff made an immediate impact, his sweetly-struck shot brining a smart save from Crossley. Cech kept Chelsea in the game by denying John before Mourinho made another change, replacing Robert Huth with Ricardo Carvalho. Fulham still possessed the greater goal threat, Boa Morte hitting the outside of the bar with a free-kick. But Chelsea thought they had equalised when Drogba sidefooted into an empty net after Crossley had rushed out of his goal. Crossley's rush of blood appeared to have cost his side dear until referee Dean, who was quickly surrounded by the home side's players, disallowed Drogba's effort after consulting his assistant. Chelsea pinned their rivals back in search of an equaliser, Boa Morte heading off his goal-line and Lampard sidefooting over from 15 yards. Then Crossley saved from Terry before Gallas was red-carded for a rash tackle on Heidar Helguson in injury-time. 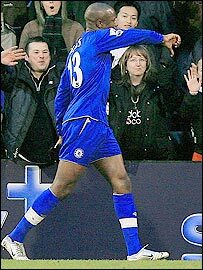 Gallas did not help matters when he aimed a thumbs down at supporters on his way back to the dressing room. But Fulham held on to move 11 points above the relegation zone and condemn Chelsea to a third loss in eight games in all competitions. Fulham: Crossley, Volz, Pearce, Knight, Rosenior, Malbranque (Christanval 89), Pembridge, Brown, Boa Morte, McBride, John (Helguson 71). Subs Not Used: Warner, Radzinski, Niclas Jensen. Chelsea: Cech, Paulo Ferreira, Terry, Huth (Ricardo Carvalho 45), Gallas, Wright-Phillips (Duff 26), Lampard, Makelele, Essien, Joe Cole (Drogba 26), Crespo. Subs Not Used: Cudicini, Maniche. Booked: Huth, Ricardo Carvalho, Drogba, Makelele.